The first thing you will notice when you open the box of this binocular is the fact that the carry bag is made of good quality. This is a surprise! There are fare more expensive models on the market without this kind of bag, the manufacturers often try to save money, and this always falls on the accessories, but not in this case. Now let us see if the rest of it is in the same shape. 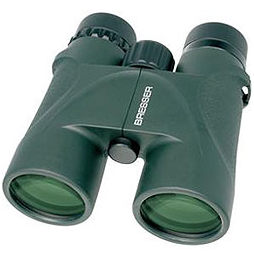 Check the price of Bresser Condor Binocular, 10x 42mm here. That is why with 8-power you get to see more of the scene, but on the other hand you get more magnification with the higher power lens. 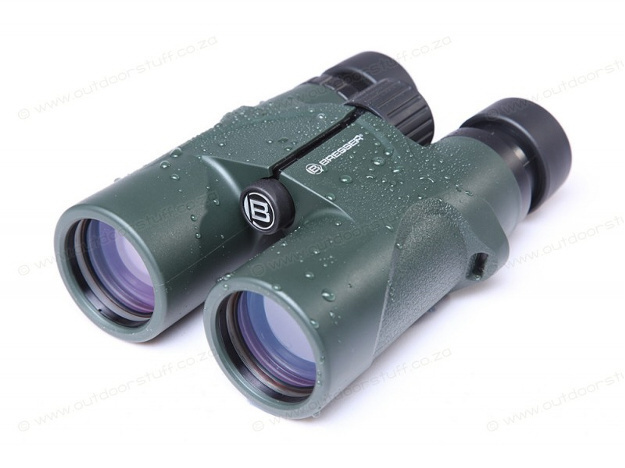 The prism used in these binoculars are BaK-4 roof prisms and are very good quality, this prisms produces brighter and clearer images. Multi level coating was used on the optics, that makes them equipped with a anti-reflection coating. This coating means that more light is able to get in your eyes when you look at the objects in low light conditions. The one thing that is missing from this low price model is that more expensive phase correction coating is not applied. This is very expensive process so it is natural that lower prices models don’t have it. This model is equipped with a waterproof designs. Also the internal air was replaced with a nitrogen gas to prevent fogging. This makes it a good choice in all weather conditions, low temperatures as well as high humidity or sudden temperature swings. Like early mornings or evenings. Eye Cups will fit nicely on the positions, and will not fall down, you don’t have to be afraid of loosing them by mistake. The eye cups are made with twist-up feature. Testing made on focusing concludes that it is smooth and fairly accurate, the focusing wheel takes about 2 full turns to focus from infinity to the minimum (closest) distance of around 3 meters (9.8ft) . This makes you turn more to focus on the subject but also gives fine tuning if you like more easier and smother focus. Diopter adjustment is easy to adjust and runs pretty smooth, it is located on the right barrel, and easy reachable. It is tight so it is not going to move by accident like on some other models. You can easily adjust both sides to allow for differences in your eye sight. This is very important function for people with glasses. These Bressers have an excellent quality soft carry bag, that includes a pocket on the inside to carry items like a lens cleaner or even your car keys. It is also designed in such a way that even though it is a "soft" bag it will provide a fair amount of protection to it's contents. This is made even more impressive considering that these are essentially low cost binoculars. I have reviewed many binoculars with a price that is more than twice the cost of these with far worse accessories. It is a pity that the neck strap is not as impressive, but does the job fine. The bag that this Bresser Condor comes in is of very good quality and a plus. The good thing is that there are extra pockets located inside the bag, that you can use for things like lens caps. The bag provides a good protection when binoculars are stored in it. Since this is a low cost model this a impressive thing. Some much more priced models have less accessories than this one. 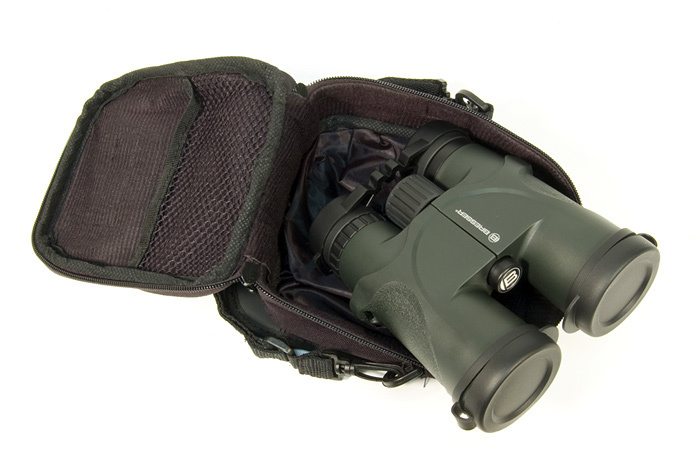 There is a neck strap also provided with the binoculars. The lens cap will not fall accidentally and is secured to the barrel of the binoculars, this way you will not lose them. Usually people can often misplace the lens cap of the caps are not attached to the binocular. If for some reason you don’t want them on the binoculars you can easily remove them. You cannot imagine how many binoculars cave been ruined by not cleaning it properly than by bumps and being dropped. Never clean the binoculars with your shirt or piece of cloth, you will degrade every image you will ever see from that pair of binoculars again. Many birders make the same mistake all over and over again. The worst thing you can do to your binoculars is to breathe-and-rub it all the time. The dust contains a microscopic particles that are in other words tiny rocks. These particles are harder than glass, and will produce microscopic scratches on your lenses. The anti-glare coating that lansesa re covered with gets destroyed this way little by little. This little scratches cannot be seen by naked eye, but will scatter light, and produce a cloudy image over long period of time. You will use your binoculars for years, and if you do that over and over you end up with an image that is far less quality than the one you started with. Buy a lens cleaning pen! Start brushing gently with the pen and clean all of the dust from the lens. The brush is made of very soft material and will not damage the glass. One more way to clean it is to blow it with air blower designed for this kind of things. If you use your breath you make it harder for yourself, as little droplets of water will make the lens more dirty. If your binoculars are waterproof you can just submerge it underwater and clean it that way, running it under the tap will do it also. This is the easiest way at home. Now that you removed the dust, wipe the lens gently with lens tissue, a special kind of micro fiber lens cloth you can buy, or a very soft cotton cloth can be used for this purpose. Never use hard materials like paper towel as they will damage the coating of your lens. The 10x42mm objective lenses are a very good setup and will be favorite for many in bird watching and outdoors. In term of general use and watching wildlife this is a favorite of mine. And a good balance between light , field of view and magnification. The size and weight are also a plus for this model. This binocular is ideal if you want to get as much possible to wildlife and not buy one that is equipped with image stabilization or spend extra for a tripod. The field of view is still nice and wide so you can make them more than decent binoculars for bird watching or similar hobby. All 10x42 binoculars are equipped with exit pupil of 4.2, so are these Bresser Condor ones, the twilight factor on these is 21, this is all good for all of the low level light situations that you can find yourself in. If we summon it all, these binoculars do have really good lenses and prisms, the coating on them is also good and cannot be complained about. The image is going to be sharp and bright in the same time. If I want to get this for the use mention before I think most users will be satisfied with what you get with the price. One thing that is not in line with the more expensive models is the field of view. For this model it is 101m at 1000m. This is much less then the high end models, but again for the price this is what you get. The other models can cost 10 times as much money if you want the best bang on the market.. The closest point where these can focus is about 3 meters (9.8ft), that falls in average category, and most other will have similar point of focus, even the best ones. These binoculars are offered at Amazon, since it is a budget model, you get a good pair that is all general binocular, that you can take camping, bird watching or hiking, and all kind of sport events. If your price tag is lower, than this is one of the best budget models that you can buy at the moment.